Convert DXF to WMF and get a neat output! You are here: CoolUtils > Total CAD Converter > Convert DXF to WMF and get a neat output! 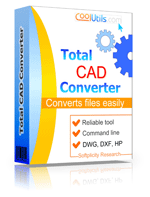 Total CAD Converter is an all-in-one file conversion utility intended for converting DXF files to WMF, as well as to PDF, TIFF, JPEG, BMP, PNG, DXF, CGM, BMP, HPGL, SVG. The program has a robust and user friendly interface and a wizard that will help you make your settings. Total CAD Converter is one of the fastest tools to transform DXF into WMF in batch. You can set this DXF Converter to manage several hundreds of CAD files, and it will take minutes for it to render them in your desired format. 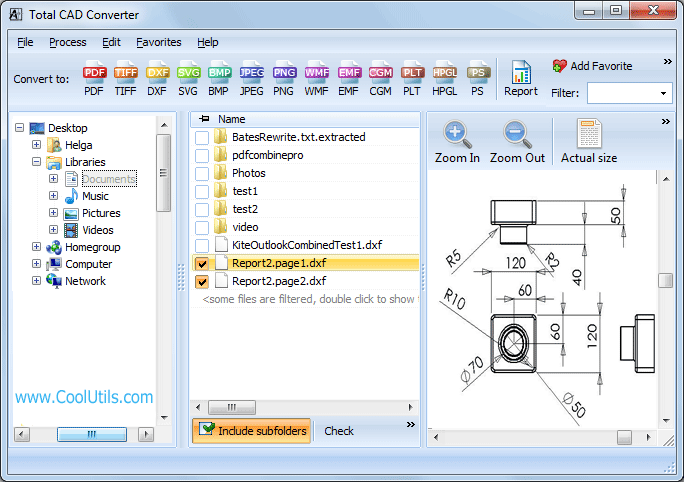 Launch Total CAD Converter and select a folder with DXF files in the left-hand panel. A list of DXF files will be displayed in the main panel. Check the files that you wish to convert to WMF. To check all files, click Check All. Then select WMF. Then follow the Wizard's recommendations. 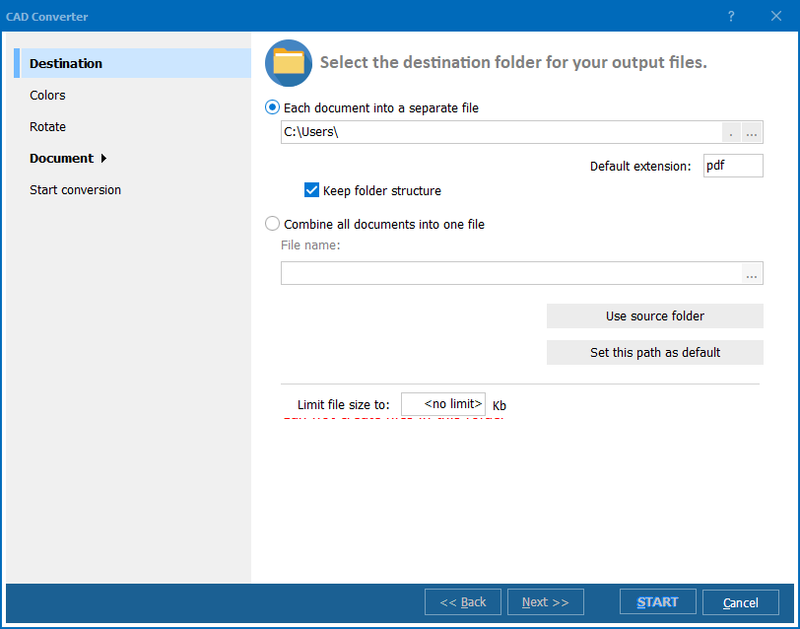 Total CAD Converter allows selecting the type of metafile (Windows metafile or enhanced metafile). 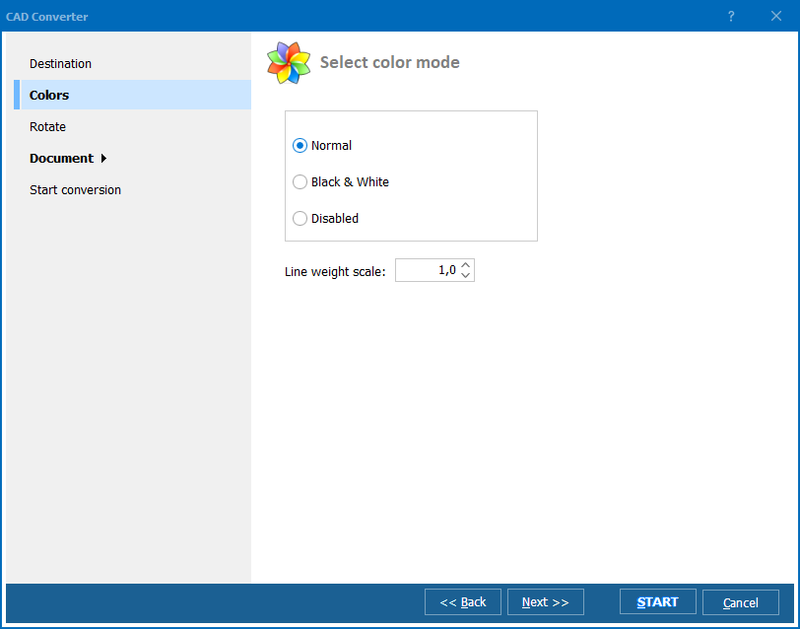 Besides you may set the color mode, resize and rotate your files during the conversion. The program can also be run from within other utilities via command line. This is truly the handiest file conversion tool ever. If you still have doubts, hit Free Download button and use the trial version. It is valid for 30 days. If you believe you like it, don't just wait until the trial period expires. Buy the key and get all tech support and updates for free! DXF (Drawing Exchange Format) is an open source CAD format that ensures data interchange of drawings (both 2D and 3D) between AutoCAD and other programs. DXF files consist of sections, each having its own code associated with its value. This format can represent all CAD drawings, and it is supported by many popular programs, such as Autodesk AutoCAD, IMSI TurboCAD, SolidWorks eDrawings Viewer, DWG2Image Converter, IMSI TurboCAD, SolidWorks eDrawings Viewer, etc. Due to rather complicated structure, DXF files are large in size and therefore need to be converted to more compact formats. By aid of this CAD Converter, you can make your DXF files into WMF files. WMF (Windows Metafile Format) files are 16-bit files that contain bitmap and vector image data and a set of instructions for Windows to restore the output image. WMF files are relatively small and therefore space-saving. Besides, WMF is supported by non-Windows based programs and platforms. Convert DWF to WMF in batches easily.